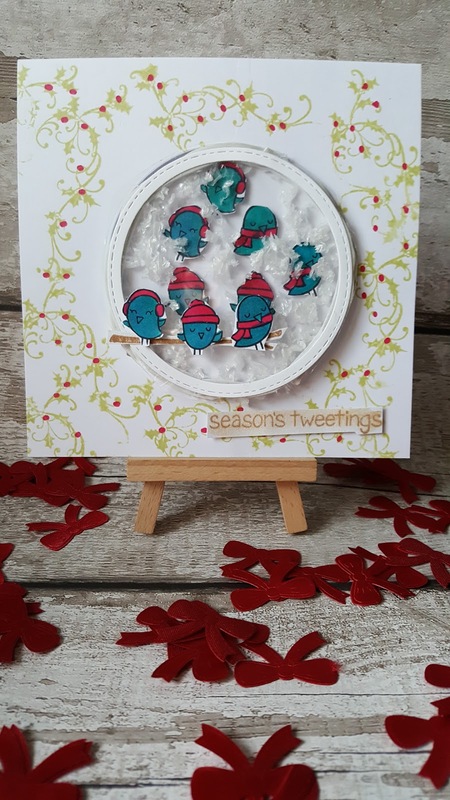 Hi everyone card number 2 in my christmas card series was made using the Seasons Tweetings stamp set from Lawn Fawn. 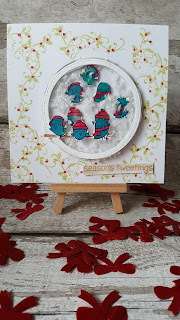 I started the card by making my shaker element and inside the shaker I used fake snow and placed some of the birdie images I had stamped and coloured, then fussy cut. I used a white 6x6 blank card as my base, I then stamped all over the front of the card using Shabby shutters distress ink and a holly stamp. I then used my spectrum Noir DR1 and dotted red dots randomly over the stamped holly images. I had used a pierced edged circle die to cut an aperture in the middle of my base card, This is where I placed my finished shaker element. I then stamped the branch image using distress ink Vintage photo and fussy cut this out, I stuck the branch across the bottom of the shaker and sat three of the stamped images on to it. I stamped my sentiment and stuck it in the bottom of my card, My card was then finished.